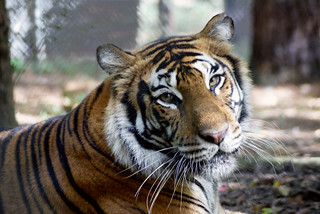 One of the many ways to support Carolina Tiger Rescue is to donate items from our Wish List. Coming out for a visit? You can bring the items with you. Don’t live quite as close? Order items from our Amazon Wish List and send them straight to us! Need to ship a donation to us? Here is our Amazon Wish List. If you donate through Amazon, please be sure to mark it as a gift at checkout and include your name in the message so that we can thank you appropriately! Want to make your donation count even more? Use your AmazonSmile account and select Carolina Tiger Rescue as your charity of choice! In addition to your wish list donation, Amazon will donate a portion of the purchase price to Carolina Tiger!